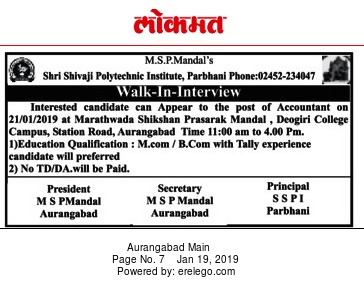 Shri Shivaji Polytechnic Institute, Parbhani has advertised in the LOKMAT newspaper for recruitment of Accountant jobs vacancies. Interested and eligible job aspirants are requested to walk-in on 21st January 2019. Check out further more details below. About College: Since it's established in 1959 the MSP Mandal has strived hard and succeeded to achieve two objectives. The first is the spread of education to the door step of the poor and needful students; the second one is imparting high quality of education. M.Com / B.Com with Tally experience candidate will be preferred. How to Apply: Interested candidates are requested to attend the Walk-in interview with CV, originals & copies of certificates and recent PP size photo to the walk-in address provided below.